For years I‘ve noticed that designers often say that they don’t mind swatching, that they love it, that it is in fact one of the most playful and creative things they do. Now that I both design and knit, I’ve noticed that there is a distinct difference between swatching for myself and for someone else’s design. Here’s an analogy: For knitters, swatching is like a driver’s exam. We really, really want to drive that red Ferrari, but before we can do that we have to pass the test. It’s stressful, and it’s in our way right now between us and what we want to be doing. For designers, swatching is taking the Ferrari out of the garage and getting to play on a private track course. How fast will it go? Will it hug the corners or drift out a bit? Is it more fun to spin tight circles or go fast on the straightaway? 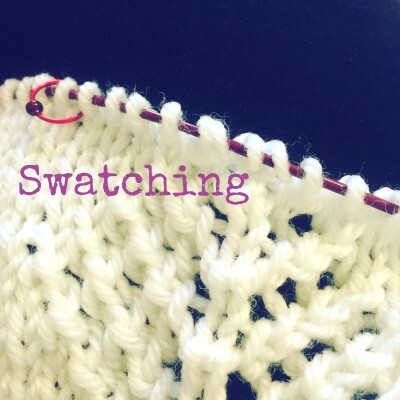 For designers, swatching is open-ended. Anything could happen. For knitters, only one thing needs to happen, yet anything could happen. I don’t know how to reconcile this. But I do have things that work for me as a knitter. First of all, I always try to swatch before I’m done my current project. That means that I’m less likely to rush it or try to cheat it in desperation to get something on my needles. Secondly, I try to remind myself (over and over if necessary) that it is important to at least get to know the yarn and how it works with the needles before I invest hours into making something. It’s not wasted time; it’s an icebreaker. Thirdly, I don’t treat it as optional, so I don’t have to work myself into a tizzy debating with myself. Do you have ways to make swatching more successful? Less annoying?